Ronald Davis has been exhibiting his work since 1963 and has had a total of 66 one-man shows in major galleries and museums all over the world. His work has appeared in countless major group exhibitions, and his paintings have been acquired by important museums and private collectors around the world. He continues to live, work, and pursue his calling on the Arroyo Hondo Mesa near Taos, New Mexico. Davis's paintings of the late sixties laid to rest the demand that important abstract painting not be illusionary. The depicted deep space in Davis's work is inspired by the Renaissance perspective of Paolo Uccello and the perspective studies of Duchamp, as well as the galactic drips and splatters of Jackson Pollock, the striated canyons of Clyfford Still, and the push-pull of Hans Hoffman. 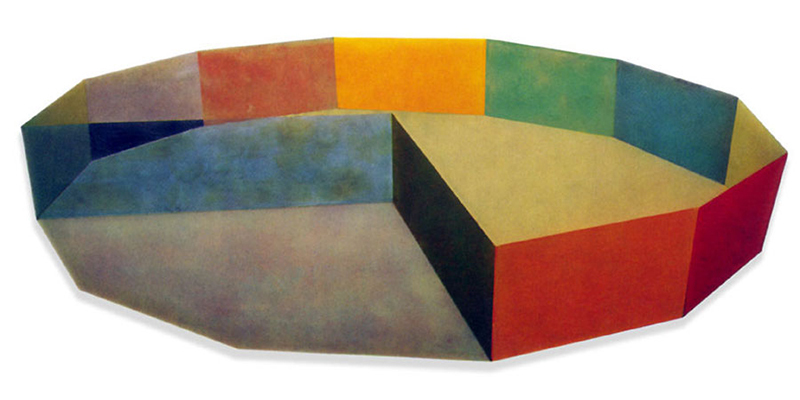 Davis's mastery of the language of color, perspective geometry, space, and time – as well as virtuoso paint handling – lend to the work a profound poetry. Davis's work can convey extreme wit, sensitivity, and a simultaneous no-holds-barred toughness. The paintings are a complex strata of paradoxes, combining technologies then new to painting with ferocious Pollock-like freedom, the balanced precision of Mondrian, and Renaissance perspective. Davis initialized a new age of the painterly possibilities of post-Einsteinian concepts. Influences of his splattered, geometric paintings of the middle and late sixties can be seen everywhere in today's art world.